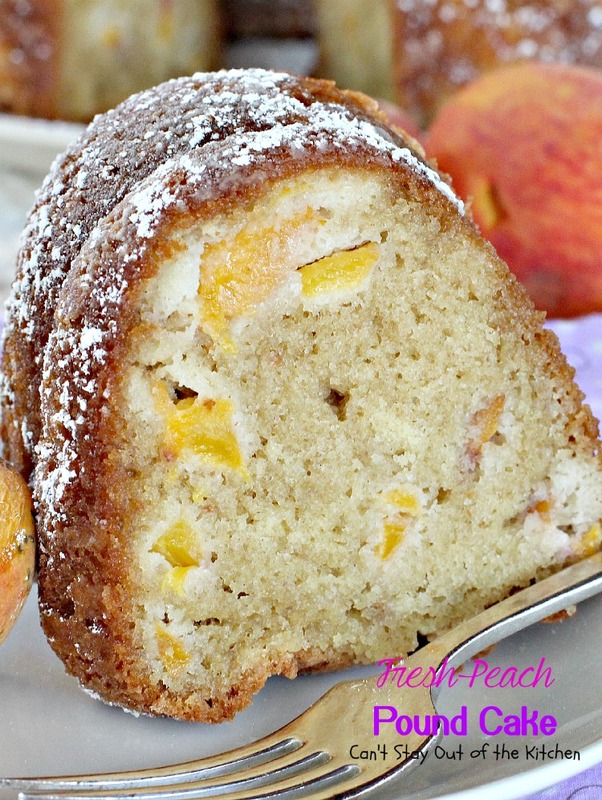 I have another delicious peach recipe for you today: Fresh Peach Pound Cake. 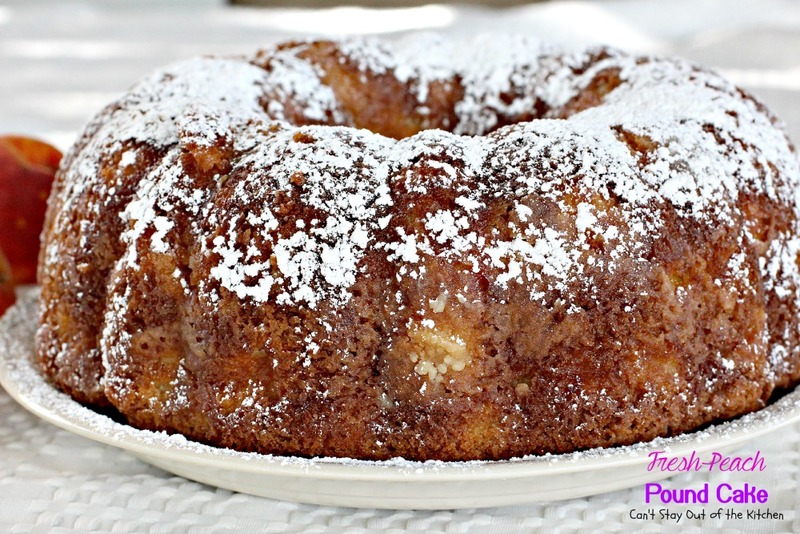 This cake is special because it’s subtly flavored with almond extract providing a delectable flavor that’s hard to beat. This is a basic pound cake recipe with the addition of peaches and almond extract and a light sprinkling of powdered sugar on top. Simple, basic, yet, oh, so good. 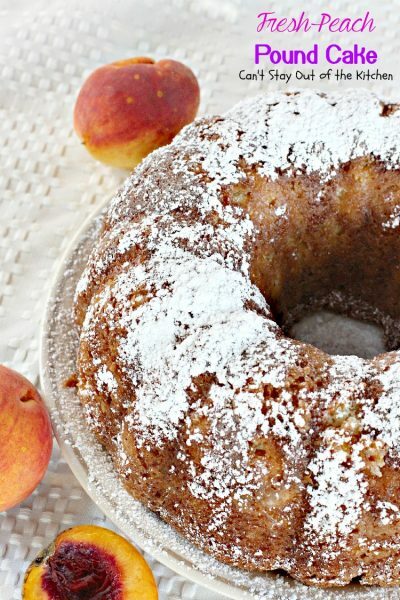 And, quite frankly, peaches and almonds make an unbeatable combination. Perhaps I need to change the name of my blog to “The Peach Blog” or something. 🙂 I have SO many peach recipes posted. 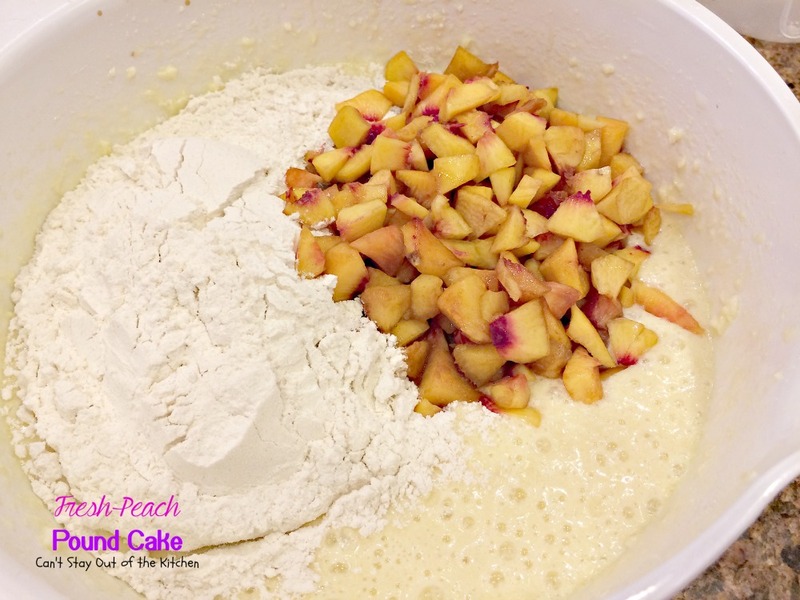 It doesn’t hurt that I love peaches, but after this summer I probably won’t be posting so many peachy dishes because we’ve moved and no longer have six mature peach trees in our back yard. I’ll miss them–sort of. I won’t miss all the work, but having fresh peaches each year was nice. If you’re looking for an easy, scrumptious pound cake recipe, Fresh Peach Pound Cake has a lot to offer. 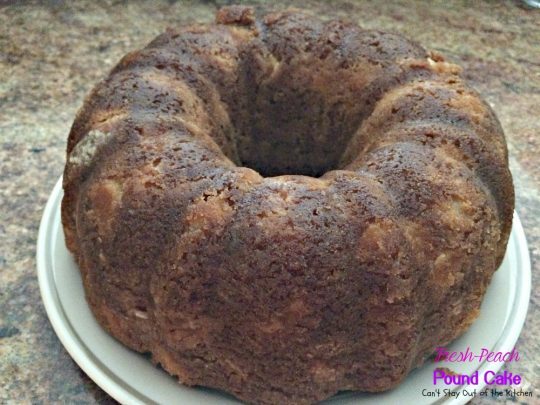 Yet, you don’t feel like you have to slave over some exotic dessert like some of the cheesecakes and other recipes that have umpteen steps, thousands of ingredients (making them super expensive), or those that take up a LOT of time. For those of you who enjoy cakes, this will certainly satisfy. Fresh Peach Pound Cake is moist and delectable. 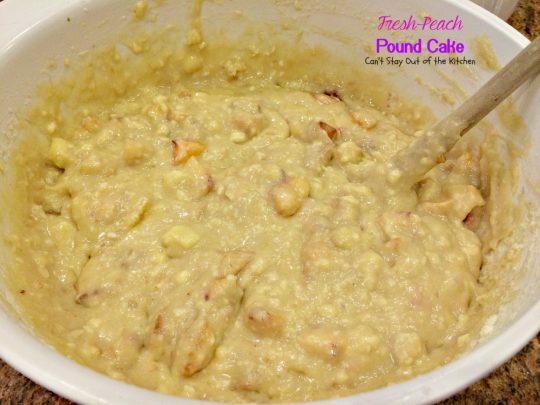 This is a great dessert to make during the summer and fall when peaches are in season. 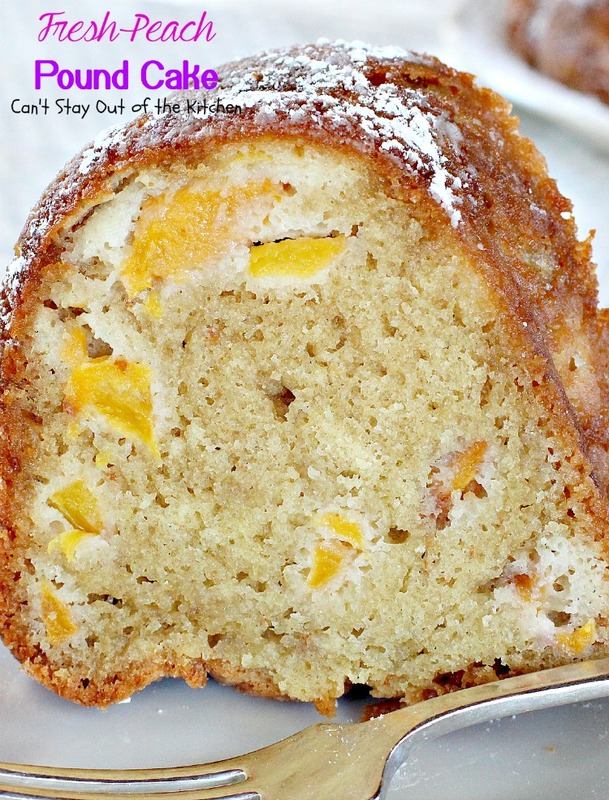 Time to dig in to a piece of Fresh Peach Pound Cake! 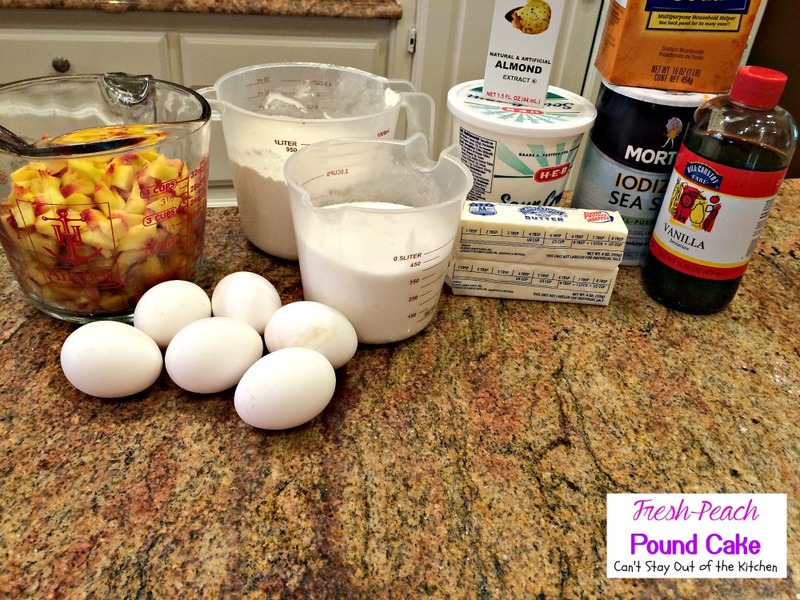 I used these ingredients, plus powdered sugar to sprinkle on the cake after it’s baked. Soften butter. Add eggs, sugar, sour cream, baking soda, salt, almond extract and vanilla. 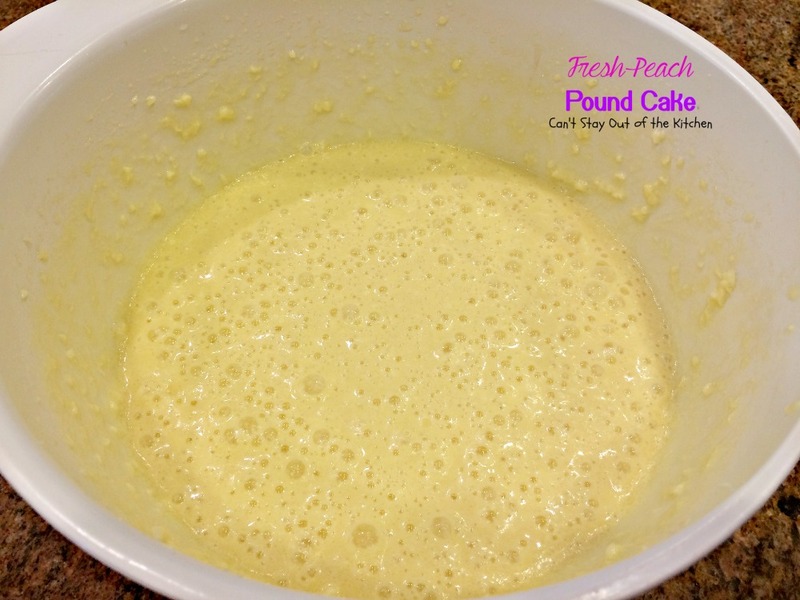 Grease and flour a bundt pan very generously. Pour batter into prepared pan. Bake at 350 for 1 hour 15 minutes or until a knife inserted in center comes out clean. Cool completely before inverting onto a serving plate. 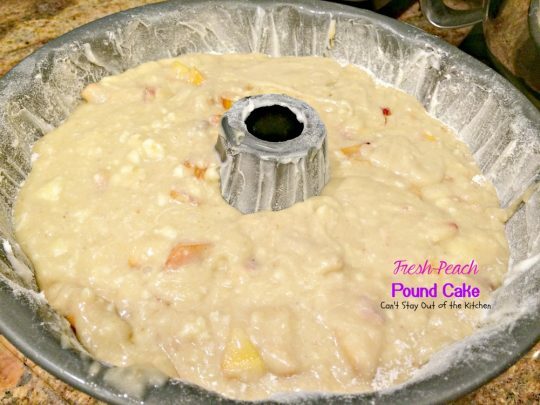 Cut in five-inch chunks one-to two-inch slices and serve. 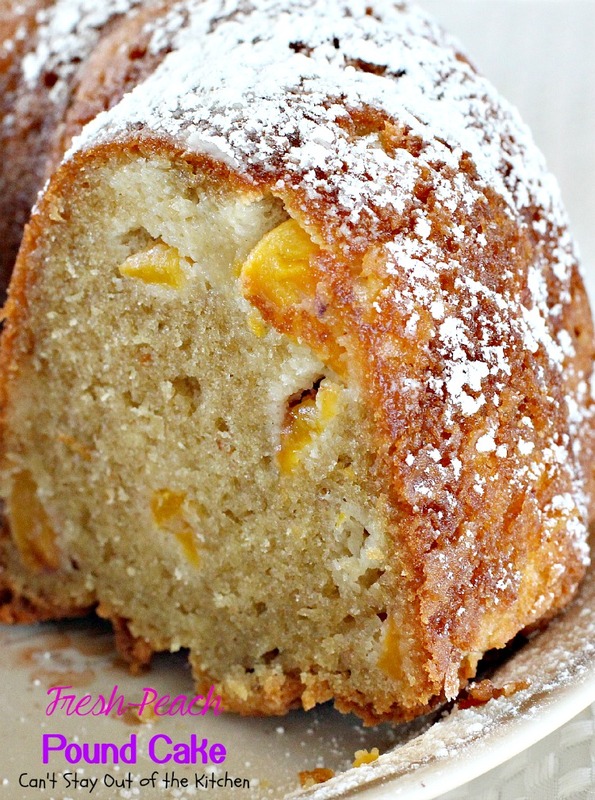 Every bite of Fresh Peach Pound Cake is marvelous. This lovely cake is filled with peaches and almond flavor to provide a delicate flavor and sour cream keeps it moist. 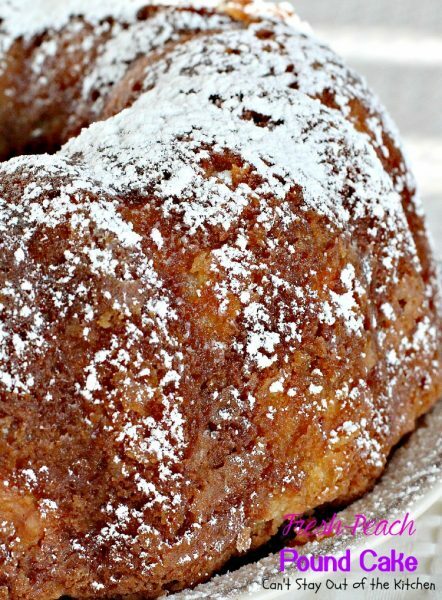 Powdered sugar on top is the finishing touch. Combine sugar, butter, vanilla, almond extract, eggs, sour cream, baking soda and salt with an electric mixer. 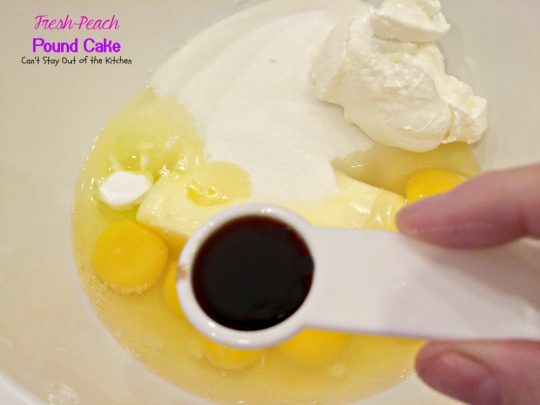 Stir in flour and peaches with a wooden spoon until combined. 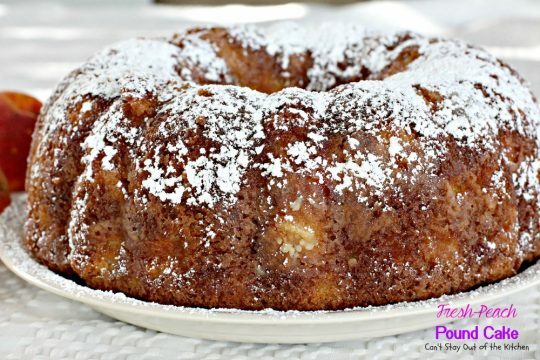 Grease and flour a large 10” bundt cake pan. Bake at 350° for about 1 hour 15 minutes or until a knife inserted in center comes out clean. Recipe adapted from A Mother's Shadow. Serve plain or ala mode. 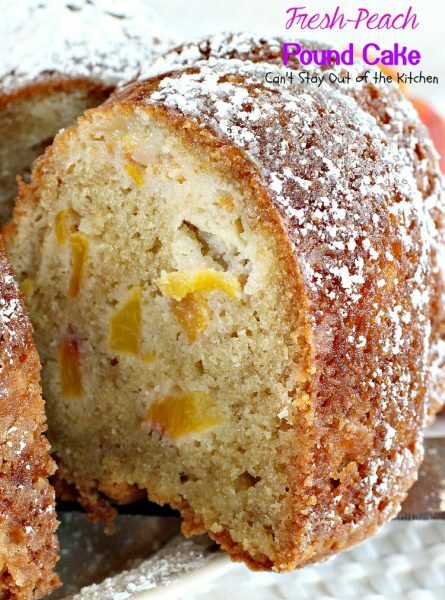 Peaches make such wonderful desserts. 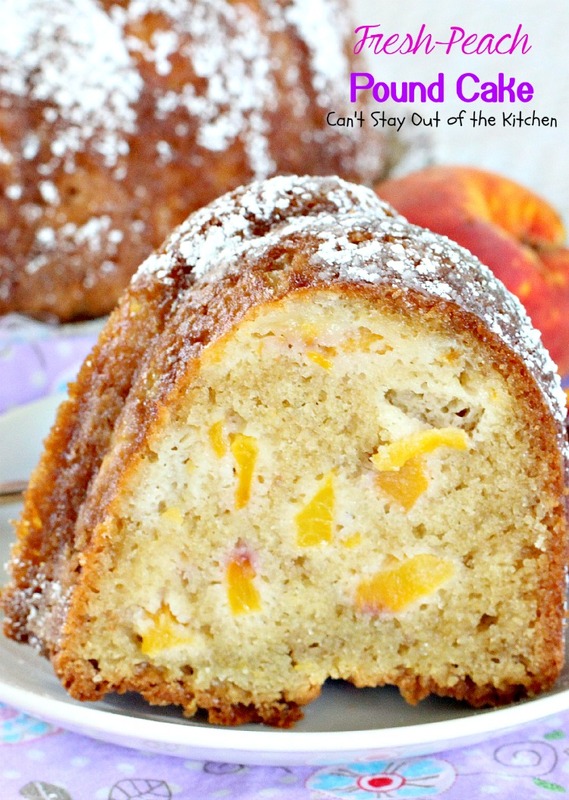 Give Fresh Peach Pound Cake a try and you’ll see what I mean.